In their report they describe injecting gold nanoparticles in mammary tissue to enhance the imaging of early signs of breast cancer. Mammography remains the clinical gold standard of screening tests for detecting breast cancer. However, a recognized limitation of this X-ray procedure is that dense breast tissue shows up as white masses and fibers on an image, which can obscure the presence of microcalcifications — potential signs of early cancer development. Other imaging methods including ultrasound, magnetic resonance imaging and molecular breast imaging can also find abnormalities, but each has its own limitation, such as high cost or poor resolution. Lisa Cole, Tracy Vargo-Gogola and Ryan K. Roeder wanted to improve patients’ options. The researchers boosted the contrast of mammography X-rays by modifying gold nanoparticles with molecules that bind specifically to microcalcifications. They injected a low dose of these nanoparticles into the mammary glands of mice with dense tissue. 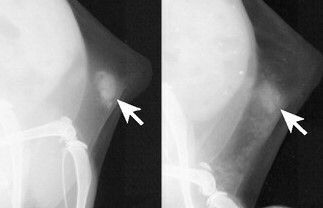 The engineered particles made the microcalcifications brighter on the X-rays — and therefore, easier to distinguish. The mice showed no obvious side effects. Although further research would be required, the scientists say the technique could eventually translate into more reliable breast cancer detection for women with dense mammary tissue.